The first settlers of the area destined to become Wood County located along the Ohio, Little Kanawha and Hughes Rivers. The population consisted almost entirely of farmers seeking land upon which they could build a home and produce a living. Farming to them was not only a means of earning a living, but also a way of life" a way of living.. They did not need and did not seek large acreages. A small tract of land, fifty to one hundred acres was all they needed. The population increased rapidly during the last two decades of the Eighteenth century and particularly after the Indian War of 1789 and the Treaty of Peace of Fort Greenville in Ohio. Wood County was named for James Wood, Governor of Virginia, 1796-1799. In 1832, the town of Ripley was incorporated, Elizabeth and Harrisville on January 3, 1822, and Saint Mary's on March 31, 1857. All four of these towns were in Wood County at the time of their incorporation. The people living in the area of Ripley were residents of Wood County, with its Court House at Parkersburg, or Mason County with its Court House at Charleston, and they found it inconvenient, time consuming, and expensive to attend Courts and serve as litigants, witnesses, or jurors, or engage in other activities requiring their presence at the Court House. The people living in the area of Elizabeth were residents of either Wood or Jackson county and experienced great inconveniences form having Court Houses in Parkersburg or Riley. Construction on the current Wood County Courthouse began in 1899. It took nearly two years at a cost of $100,000 to complete the huge, five-story structure. 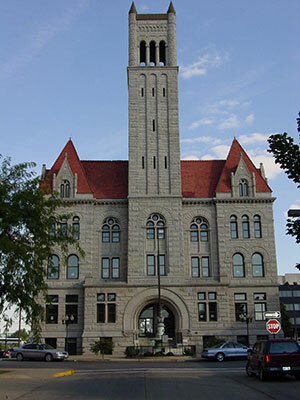 Built with native sandstone, the Courthouse is an excellent example of modified Richardsonian Romanesque architecture. The exterior is highlighted with ornate turrets, balconies, stilted arches, a bell tower and unique, symbolic carvings. An intricate marble fountain featuring a bust of former State Circuit Judge James Monroe Jackson was erected near the building's west entrance in 1901. The Wood County Courthouse, listed on the National Historic Register, is said to be fireproof thanks to the massive amounts of iron and steel in its framework. The cornerstone of the massive framework was laid in place by the Masonic organization during Wood County's Centennial Celebration in 1899. The interior of the Wood County Courthouse reflects the craftsmanship of woodworkers and stained glass artisans of the late 19 th century. Finely detailed oak woodwork can be found on the desk and scrolled railing in the second floor judicial room. In the early 1980s, an organization of local residents saved the fifth Wood County Courthouse from proposed destruction. The building underwent an extensive renovation in 1983 and 1984 at a cost of $1.5 million. As the rallying point for the County's 1999 Bicentennial celebration, a time capsule was placed near the west entrance. It is to be opened in 2099. In 1799 the first recognized Wood County courthouse was the log cabin home of Wood County Justice Hugh Phelps . The home was located south of the Little Kanawha River in an area called Neal's Station. The second Wood County Courthouse was constructed near the mouth of the Little Kanawha River in 1800 . The county's first permanent-structure courthouse was made of logs hewn from nearby walnut trees and served the area from 1800 to 1817. The third Wood County Courthouse, constructed in 1817, was made from timber, stone, handmade brick, glass and iron. It was built in an area of Parkersburg now called Court Square. This site has housed every Wood County courthouse since then. Completed in 1860 at a cost of $25,000, the fourth Wood County Courthouse had a typically Southern appearance due to a modified classic design with Greek columns, though l ightning destroyed the graceful steeple. 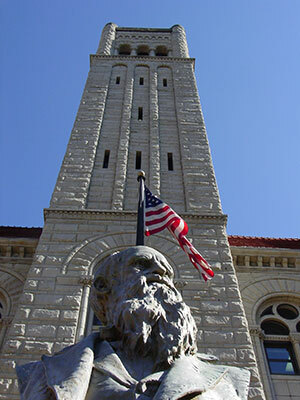 During the Civil War, the fourth courthouse was also used as headquarters and a hospital for Federal troops. Though it would close in 1899, the fourth courthouse witnessed the most rapid period of growth in Wood County population and wealth. The first four Wood County Courthouses were centers for political, economic and social events. Several church societies met inside the Courthouses, including the Baptist, Episcopal, Methodist and Presbyterian societies. The area's first Masonic Lodge held its meetings in the Courthouse on Court Square. During the hot months of summer, courthouse officials could be found in a shady spot between the square's buildings, playing a heated game of marbles. Extending from the banks of the Ohio River down the Interstate 77 mountainside corridor, Wood County is a blend of rugged country beauty and metropolitan activities. For the outdoors type, boating on the Ohio River is a great way to spend a day. Whether casting for an Ohio musky or racing a powerboat, the Ohio River is large enough to handle it all. More inland, canoers and hunters will enjoy the bountiful streams and game. For those more into traditional athletics, the Wood County area features a number of softball leagues, basketball courts and high school stadiums guaranteed to keep your year-round sports attention. For those who enjoy the indoor scene, the Wood County arts community is a well-established outlet for creative expression. Museums, vaudeville theaters, a ballet company and the satellite home for the West Virginia Symphony will keep many artistic supporters entertained. Shoppers will enjoy Grand Central Avenue, anchored by the Grand Central Mall. The mall features more than 100 stores and neighbors a number of different restaurants. Visit Parkersburg/Wood County Convention and Visitor's Bureau for more information about Wood County sites and attractions.